Marta and David decided to celebrate their wedding at the Hotel Cortijo Bravo in Malaga, a boutique hotel belonging to the B Bou chain, a perfect place for getting married. 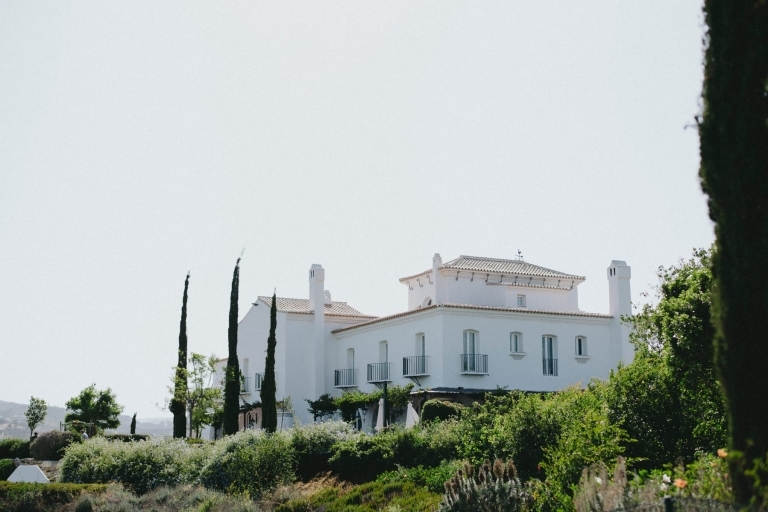 With a contemporary style, reminiscent of an old Andalusian farmhouse and an elegant decoration typical of Andalusian stately homes, it is located in a privileged natural environment with magnificent views of the sea. 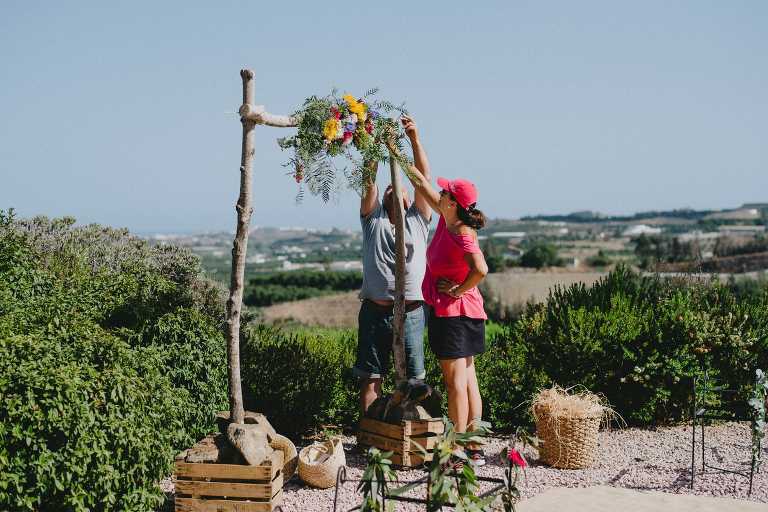 This small boutique hotel is the ideal setting for a rural wedding in Malaga, as it is an idyllic place that has all the modern comforts but maintaining the charm of the Malaga mountains in La Axarquia. And this is the place that Marta and David chose to celebrate the casual wedding with a surfer touch that they had in mind. The event was planned as an afternoon wedding. Marta and David, both stayed at the Hotel Cortijo Bravo, where they got ready for the big day surrounded by friends and family. Marta wore a white dress designed by Malula by Alicia y María with a lovely neckline, a Bambary crown and a veil over her loose hair. The bouquet, like all the floral decoration of the wedding, was run by La Botánica Creación Vegetal. David wore an elegant green suit with a white shirt, Vans shoes, and an original vest with surfer motifs. The ceremony of this civil wedding in Malaga took place outside of this boutique hotel and was officiated by a friend of the couple. For the ceremony they arranged a wooden altar with flowers that would be the witness of this original wedding in Malaga. The ceremony was quiet and informal, and especially moving when brothers and friends intervened to give their good wishes to the couple. 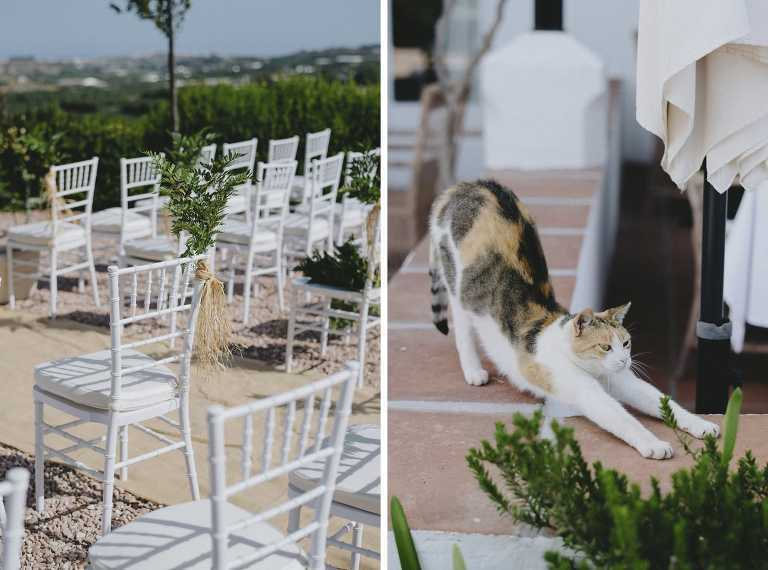 Right after the ceremony we went for a walk around the hotel to take the couple pictures in the locations we had previously selected, resulting in beautiful natural wedding photos with stunning views of the Axarquia villages. Once we finished the couple photoshoot, dinner began. The views from the terrace where they decided to hold the buffet dinner for this al fresco wedding, were lovely. It was all arranged in long white tables decorated with citrus and flowers motifs and garlands that would illuminate the scene when the night fell. Everything was enlivened by the popular band from Malaga Jam Street, who took care of the musical atmosphere during the ceremony and the cocktail. Dinner consisted of a Mediterranean buffet with typical Andalusian products, certainly an original idea that it’s becoming more and more popular nowadays in informal weddings, followed by the traditional throwing of the bouquet and the cut of the cake. But what everyone enjoyed the most was the hilarious party that started with the opening of some Jägermeister bottles and the music of another popular band in Malaga, Los Electroduendes. As a wedding photographer in Malaga and Marbella, once again, it has been a pleasure to tell the story of this incredible couple. Congratulations to the bride and groom!